Recorded between the years of 1995 and 1998, this music represents a moment in time when all of the Legends lived under one roof in the Outhouse Village with one bathroom and 4 studios. Untamed bass, tape hiss, young voices and years of flavor all on one disc! 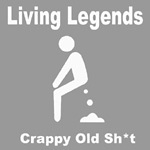 Enjoy this chapter of Living Legends music history. Please note: the copy currently in stock (new, shrink wrapped, unopened) is cut on the outer edge of the jewel case. Track 1 Produced by Elusive. Tracks 2-8, 10, 11,14 & 16 Produced by The Grouch. Tracks 9 & 12 Produced by Sunspot. Tracks 13 & 15 Produced by Eligh. This is classic underground hip hop. If you are a new fan of living legends and haven't heard this, do your homework. This album will give you a true feel for these guys and how they started and where they are coming from. Even then when they didn't have the resources they have now, the music was dope.